Type KLG electric heaters heat rubber cutting knives, trim blades, burn-in knives, and other tools requiring heat for efficient performance. To increase safety, heaters are equipped with a pilot light, and a perforated guard to prevent contact with heater surfaces. The Type KLGT heater comes with a thermostat. UL-Listed — safety tested and certified by Underwriters Laboratories, Inc.
Heaters come to full heat quickly and maintain constant heat. Separate heater allows greater flexibility and safety compared with an “all-in-one” cord-connected heated tool — no tangled cords or restricted work space. 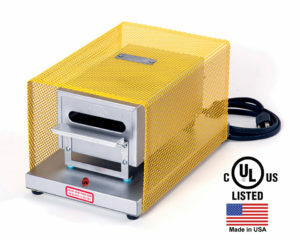 Oven is accessible from front and back for multiple tool heating. Adaptable for European electrical settings. Secures tool in place and allows better contact with heating element, allowing faster heat transfer. Allows easier insertion and removal of knives or tools. KPGT and KLGT heaters include a thermostat for heaters used in applications requiring less temperature variation. Heaters with the thermostat option have their own model numbers. NOTE: Maximum temperatures indicated for all heater models are to be used as a guideline only. Actual temperature achieved for each model is determined by user application, operating conditions, and the size and shape of the tool or knife being heated.